The G 65.3+5.7 supernova remnant (SNR) is situated just north of Albireo and hence easy to locate. 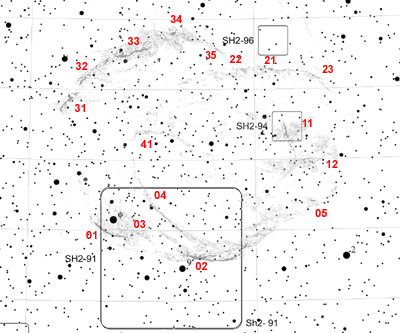 Parts of the SNR were catalogued already by Stewart Sharpless as entries Sharpless 91, 94, and 96. 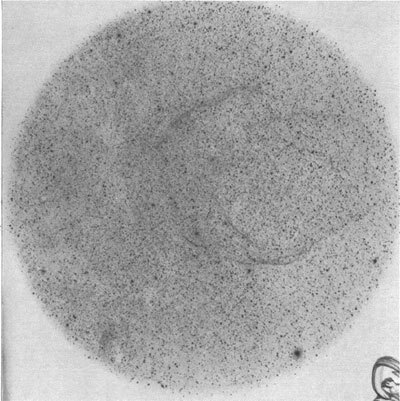 Gull, Kirshner, and Parker discovered on OIII images obtained with a micro channel plate that these faint filaments were part of a much larger SNR structure (upper right image), comprising as well other filaments, that were not or only hardly visible on the POSS red and blue plates and hence not recognized by Sharpless (middle right image). 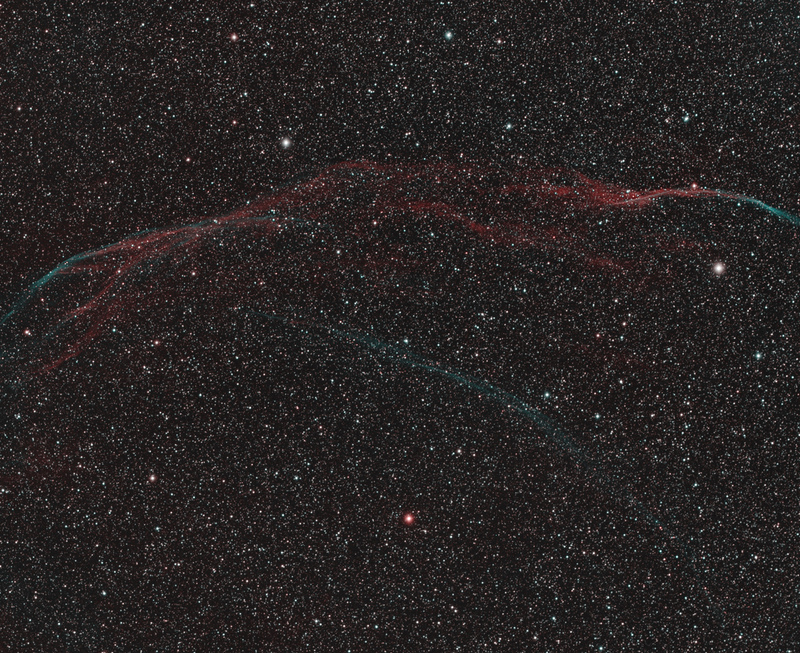 The entire SNR has a diameter of roughly 3° and hence a similar size as the Veil Nebula. The filamentous structure is very similar as well, it is, however, considerably fainter. This is partly due to the larger distance of about 2500 LYs as compared with 1500 LYs for the Veil. Furthermore, G 65.3+5.7 is with an estimated age of 30000 years considerably older and more evolved as compared with the Veil, that has an estimated age of about 7500 years. The power of SNR G 65.3+5.7 is already considerably declining. 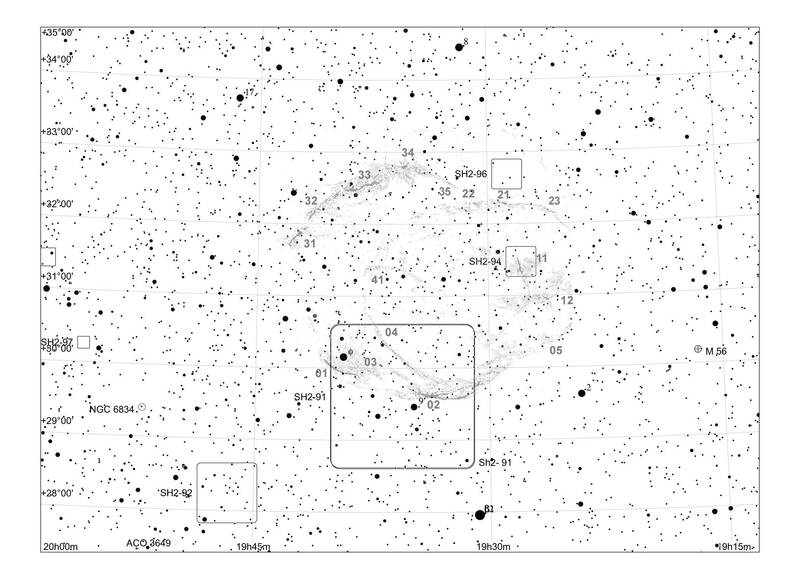 Based on an image by Fotis Mavromatakis of the Shinakas Observatory on Crete in Greece (lower right image) I have prepared a finder chart of the entire SNR (lower right, linked to a larger map). The SNR is easily located starting from Albireo. North of Albireo are the two mag 5 stars Phi and 9 Cygni, which mark the position of the brightest filament, Sharpless 91. From Phi Cygni, there is an easy star hop to the unnamed NE filament of the SNR and a somewhat less obvious star hop to a distinct star pattern east of the southern filament of Sharpless 94. Sharpless 96 follows just north of it. Here are my observing notes sorted according to the different regions of the SNR, using the numbering scheme in the finder chart. All observations were done with my 22" Dob and OIII filter, using mostly exit pupils of 7.0 and 5.2mm. 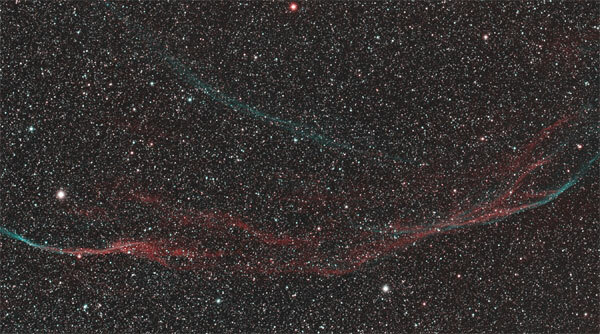 The brightest part of the SNR is filament 01, which is directly SE of Phi Cygni and which appears as a very faint narrow segment. Coming from NE, it is passing through mag 8.2 star HD185735 about 15' south of Phi Cygni. 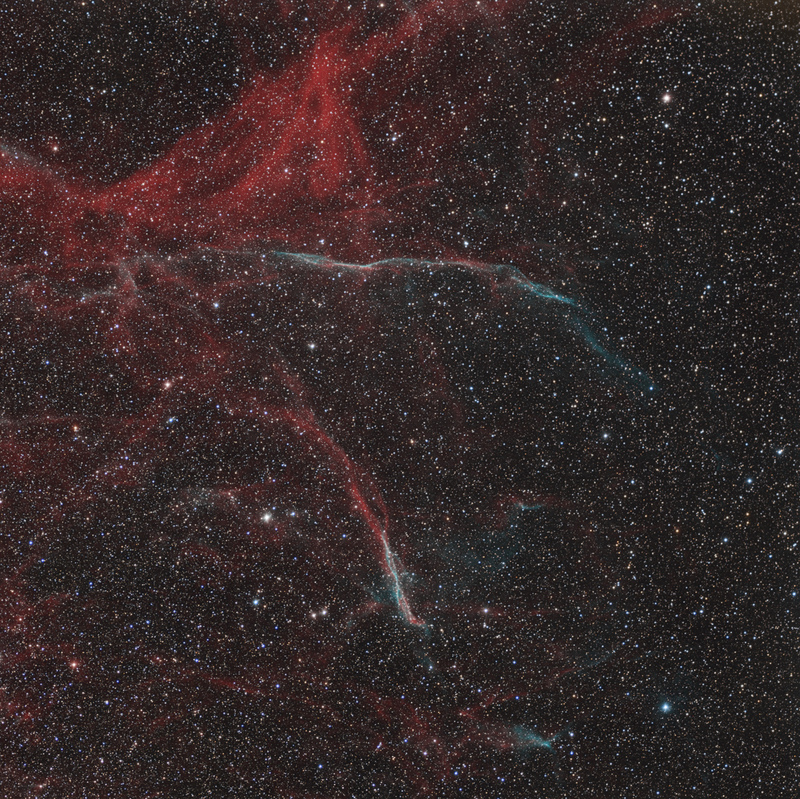 The filament extends beyond this star, becoming fainter and more diffuse. After having passed behind 9 Cygni, it can be picked up again as a better defined filament 02, and even the bifurcation towards 2 Cygni to the west can be perceived. Parallel and NW of filament 01 is extremely faint filament 03, which I have not observed yet. Filament 04 is even a bit further NW and appears fainter and narrower than filament 01. The observation can be verified by its precise location relative to a mag 7 and two mag 8 stars aligned to it. In the very west is filament 05, an extension of filament 02, which I have not observed yet. The filaments of Sharpless 94 are considerably fainter than those of Sharpless 91. After many unsuccessful attempts, I was able to observe the southern end of filament 11 as an extremely faint N/S oriented elongated glow. Towards north, the filament merges with the background and I could not trace it up to the two conspicuous mag 10 stars. The southern E/W oriented filament 12 could not be observed up to now. 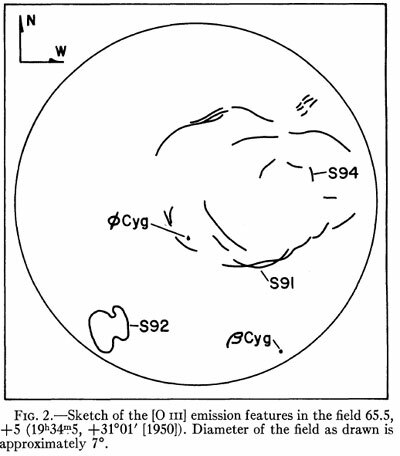 Sharpless 96 comprises besides the long SNR filament also HII regions, which are possibly not associated directly with the SNR. 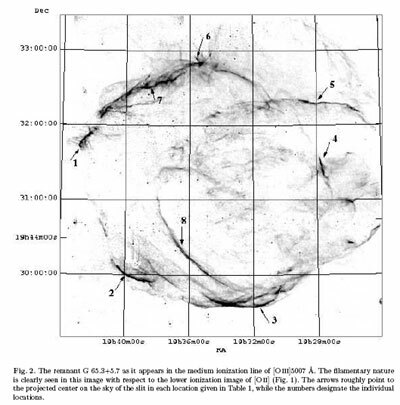 The catalog position of Sh2-96 is therefore not coinciding precisely with the position of the long SNR filament. In this area, filament 21 was several times suspected as an extremely faint and narrow filament. This series of filaments does not bear any catalog designation. Of these filaments, filament 33 appeared as the most distinct. It trails between the two mag 7 and mag 8 stars HD185602 and 185660 and can best be viewed about 15' west of this pair as an extremely faint structured glow slightly above the background. Further towards E, filament 32 becomes somewhat fainter and was visible as an extremely faint patch trailing north of another fainter pair of stars. Filament 31, which appears relatively bright on the OIII images, was similarly bright. Its very narrow angled southern end was about similarly difficult as the broader part of it that trails towards NW. At the other end of this part of the SNR is filament 34, of which the brightest part appeared as an extremely faint elongated patch. Filament 41 is in the central part of the SNR and is an extension of filament 04, turning towards west. Not yet observed.